Now I have the mood to give some health tips. It's more of a way to stay healthy through the abstinence from hazardous drinks. I have just received an e-mail about soft drinks. The most terrifying fact about drinking soft drinks. I am never going to touch Coke ever again. 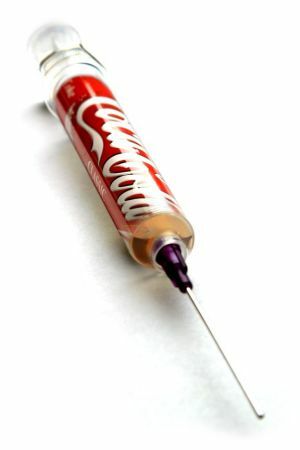 Well, I have stopped drinking Coke for quite some time but not to the extent of banning it from my food intake. But now, I WILL. Some of you might think, how can soft drinks be harmful when they are designated for children? Other than being too fizzy, surely there's no harm in consuming soft drinks, right? Yes, a glass or two might not be enough for the effect to show but try drinking a litre or more. Some facts that are necessary for you to know about Coke, the king of soft drinks. It applies to other soft drinks as well but let Coke be the representative for now. Fact 1: Coke has ethylene glycol as part of its ingredient. Ethylene glycol is a known slow poison in the caliber of arsenic. Can you see how powerful it is? Fact 2: Coke contains phosphoric acid that causes the pH value of this 'remarkable' soft drink to be as low as 3.4. Drink some more and you will thin your stomach linings. Fact 3: Teeth and bones can never be dissolved even if their buried in the ground for ten years or a thousand years. But this fact is busted with Coke. It only takes ten days to dissolve a tooth. Fact 4: Drinking Coke after your meals will not only stress your digestive system but at the same time also diluting the enzymes useful for digesting food. Consequently, food is not digested but fermented. Fermented food in the body accumulates toxin in the body and various diseases will start looking for you. Fact 5: 4 litres of Coke within an hour is lethal. Isn't this the most horrifying fact? Don't believe me? I advise you not to try it. I don't want to be responsible for any deaths. A Coke a day keep the doctor nearby. Unless the doctor is really handsome then it's a different story. Drink more soft drinks and you can meet your doctor every day. Avoid soft drinks whenever you can. Try mineral water in the theatres. They go along well with caramelized popcorns too.